Extract and Convert Microsoft Outlook Email: How to convert Outlook email that has been saved to your Windows hard drive as .msg files? How to convert Outlook email that has been saved to your Windows hard drive as .msg files? Recently we were contacted by a customer who asked if the MessageExport add-in for Microsoft Outlook could be used to export emails that had already been saved to a Windows desktop folder. The emails were saved as Outlook .msg files, which are individual email messages that contain all of the original email metadata and file attachments. The MessageExport add-on functions from within Microsoft Outlook. It is designed to enhance Outlook's abilities to export email. With MessageExport you can save Outlook emails to numerous file formats: pdf, mbox, eml, jpg, csv, and yes, even .msg format. After those emails have been saved by MessageExport to your hard drive, what else can MessageExport do with them? Nothing, actually. MessageExport wasn't designed to work independently of Outlook. 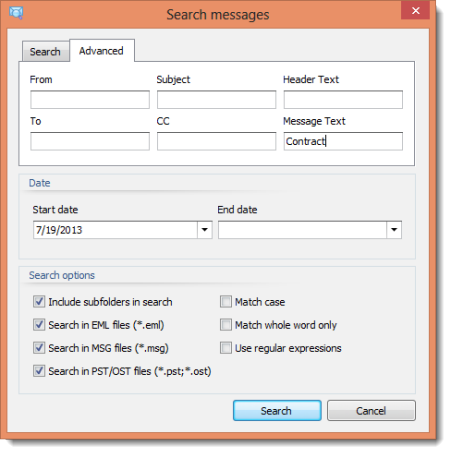 Being tightly integrated with Microsoft Outlook gives MessageExport powerful advantages, such as being able to take advantage of Outlook rules and search. But it can't further manipulate the email messages that it has saved outside of Outlook. It just wasn't designed to do that. One way to solve the issue of managing email-formatted content outside of Outlook would be to use an email viewer. Encryptomatic LLC, the developers of MessageExport, also develop PstViewer Pro. It's an email viewer that does not require Microsoft Outlook. PstViewer Pro performs many of the same functions of MessageExport, but it works entirely from outside of Outlook. Pst Viewer Pro can read Outlook .pst or .ost files. It can also search and convert .msg and .eml email messages. Using PstViewer Pro, our customer could locate the folder containing his .msg emails. Whether he had just a few, or thousands of them, Pst Viewer Pro would read them individually and organize them into a mail list. .Msg files can then be sorted and searched using PstViewer Pro's advanced search feature. .Msg emails can also be converted to different formats with PST Viewer Pro. Select the target format from the drop down list, and click the export button. PST Viewer Pro can convert .msg files into .eml, mbox, csv, pdf, and other formats. If we wanted to convert .msg files into a comma separated values (csv) format, we would first select the messages from the mail list. Then, choose the target format, CSV, from the drop down list. Lastly, click the yellow export button, as shown in the image below. While MessageExport is an excellent tool for saving email outside of Microsoft Outlook, it was not intended for managing email outside of Outlook. If you have this need, download a free trial of PST Viewer Pro and try it for 15 days.